The first comprehensive description of Shakespearean original pronunciation (OP), enabling practitioners to answer any queries about the pronunciation of individual words. We all know the classic Shakespearean lines – “To be or not to be,” “O Romeo, Romeo! Wherefore art thou Romeo?” or “Shall I compare thee to a summer’s day?” — but how would these famous lines have sounded to Elizabethan audiences? Are we currently misinterpreting the Bard? This question has been on the mind of Shakespeare scholars, directors, actors, and audiences for a long time, and has proved a tricky problem. The central issue is how to re-create an oral phenomenon, with predictably few pronunciation guides to work from. Again, should we be reading this ‘Where’ and ‘Nhere’ or ‘Weer’ and ‘Neer’? Through analysis of spelling variants, rhymes, and current usage, these questions are finally being answered. To modern ears, Shakespearean speech sounds a strangely familiar cross between contemporary Irish and Scottish, with a hint of Yorkshire and Bristolian thrown in. Test your knowledge of common Shakespearean words with our quiz, and listen to recordings of all the phrases – as the Elizabethans’ would have heard them. How well do you really know Shakespeare? Featured and Quiz Image Credit: ‘Edwin Landseer, William Shakespeare’ by Chaos07. CC0 Public Domain via Pixabay. This blog was written by the Oxford Reference marketing team. 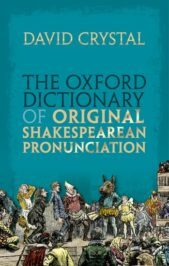 Available both in print and online, The Oxford Dictionary of Original Shakespearean Pronunciation is the first comprehensive description of Shakespearean original pronunciation (OP), enabling practitioners to deal with any queries about the pronunciation of individual words. The online edition also gives access to sound files of its 20,000+ entries – allowing you to hear Shakespearean pronunciation for yourself, as it would have sounded.